Every semester a number of United Nations ambassadors and delegates visit our campuses to speak about a range of topics specific to the region they come from, the work of the United Nations, current events, and issues of global significance. All lectures are taped and available on our gig.org website. The forums are free and open to the public. 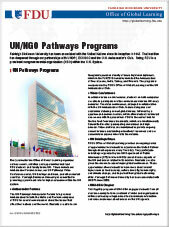 Fairleigh Dickinson University, in collaboration with the Ambassador's Club at the UN, sponsors interactive video conferences with the UN every semester. Video conferences feature several ambassadors, delegates and academics debating current global issues, followed by a question and answer session with faculty, students and staff at multiple universities. Live video feed from the United Nations is broadcast to both of the Fairleigh Dickinson University campuses as well as participating sites from universities across the nation. Please visit our Global Issues Gateway, GIG (http://gig.org/ge/?vid=4027) is an educational website that serves as a gateway between the university community and the world and acts as a major resource in preparing world citizens. We welcome you to visit the Global Education Gateway, the new homepage for Fairleigh Dickinson University's global learning mission. The site features the mission & vision and the history & heritage of the university. It also have up-to-date global events for FDU and features news & highlights of the various global activties of the university.